Lake Powell is the 2nd largest manmade lake in the country, measuring 186 miles and over 1,900 miles of shoreline. Visitors to the lake can explore 96 red-rock canyons and enjoy every type of water activity imaginable, including swimming, boating, fishing, snorkeling, scuba diving, and skiing. 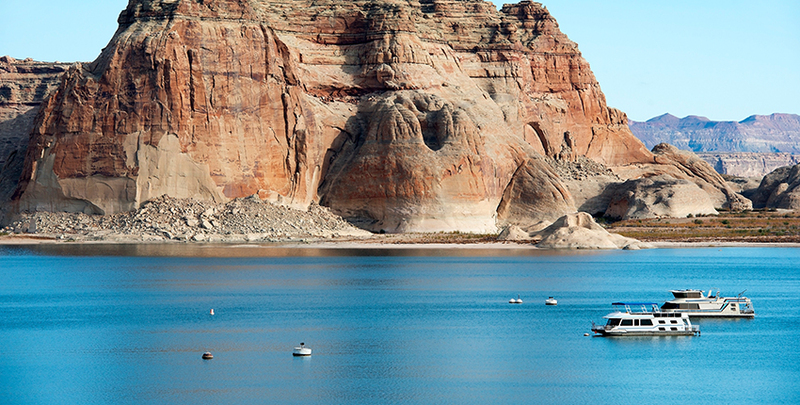 Lake Powell features four marinas where you can rent a boat or take a guided boat cruise. If you love fishing there are many varieties of fish you can catch at the lake, including carp, catfish, bass and crappie. Are there equipment rental places next to the lake? PWC and boat rentals are available at all four marinas. Wahweap and Bull Frog marinas also offer tour boat cruises of up to seven hours. Are there any museums near the lake? Only minutes from Lake Powell, visitors will find the John Wesley Powell Museum. Within this namesake museum, you can see pictures of John Powell's Colorado River excursions and a one-of-a-kind collection of pioneer and Native American relics. Guests can pick up souvenirs at the museum book store and gift shop.